One of the most important roles of a public library is to preserve the local history of a community. Here at DCL that is something we take very seriously. Not only do we have a climate controlled archive space where we maintain historic records and photographs, but we are also working diligently to digitally preserve these materials and make them available to the public. 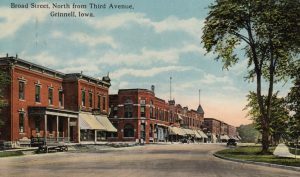 The Poweshiek History Preservation Project (PHPP) is a collaboration with Grinnell College that allows us to make the materials available in a searchable, online database. In an effort to raise community awareness about local history and the materials the library is working to preserve, we maintain an active Facebook page for PHPP. We post historic photos 4-5 times per week to share with the 2700+ followers who have ties to the community and now live around the country. We encourage memories and stories and it is great fun to follow along.